This statistic depicts the results of the National Health and Nutrition Examination Survey (NHANES), which is conducted by the Centers for Disease Control and Prevention (CDC). 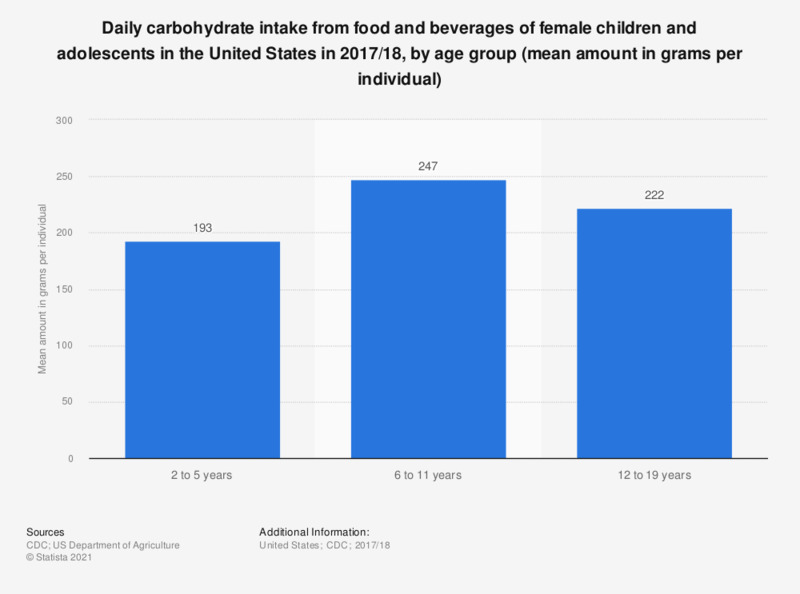 The statistic shows the daily carbohydrate intake from food and beverages of female children and adolescents in the United States in 2015/16, broken down by age group. In that year, 6 to 11 year old U.S. female children and adolescents had a daily mean carbohydrate intake from foods and drinks amounting to 237 grams per person. Sample weights designed for dietary analysis were used to allow estimates representative of the U. S. population for the years of collection. The statistics in this table are estimated from Day 1 dietary recall interviews conducted in the What We Eat in America, National Health and Nutrition Examination Survey (NHANES) 2015-2016.